How easy is it to keep a LineageOS phone updated? Does it work automatically over the air, like on a normal Android? @switchingsocial Updates are pretty easy, especially official ones. if non official subscribt to xda forum nd flash if new version is out. easyto. download to sd card, boot into recovery and flash from sd card. @switchingsocial yes, ota works. Even on LineageOS #microG. Only major system upgrades can cause "problems" (e.g. 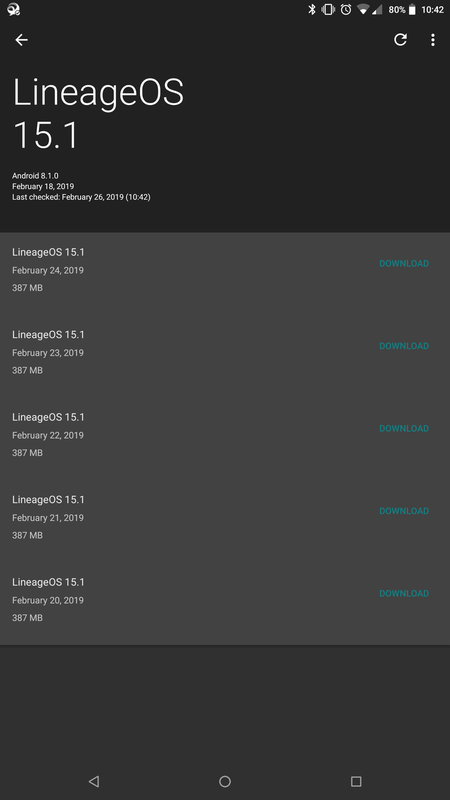 lineageos 14.1 → 15.1), i.e. you need to manually flash the new image. @switchingsocial I'm running an unofficial build, but it's dead simple in twrp either way. @switchingsocial As people have mentioned - for official builds, yes, there's OTA updates. Nightlies, in my case. You can hit the '...' menu in the top right and then 'Show Changelog' to open up the commit history in a browser. I'll be the one that goes against the grain and say that the OTA update system on official LOS is flakey at best (although it's quite known on the Reddit sub), and I used LOS since it was CM. When I hit the update button I expect more often than not to have to do the update manually in TWRP. Running LineageOS on a Nextbit Robin for a few months. Very easy to update, I actually had to turn off the daily update notifications just out of annoyance. I was upgrading every day for a few weeks when I first flashed it and it never failed. I referred to this post to stop updating.